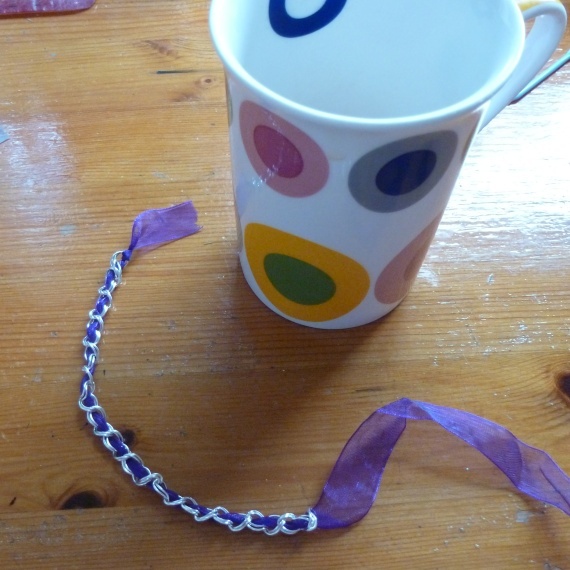 Little Harriet: Chain and Ribbon Charm Bracelet- A Tutorial of Sorts. 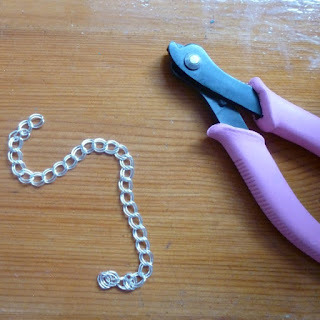 Chain and Ribbon Charm Bracelet- A Tutorial of Sorts. Welcome to Handmade Monday! This week I have been making chain and ribbon bracelets, it’s a new technique for me and I thought I would write a sort of tutorial to show you what I did and leave myself a record to look back on. It is really easy and I think it is quite effective, I have lots of different ideas using different coloured ribbon and chain, I think I will be visiting my local haberdashery shop very soon! 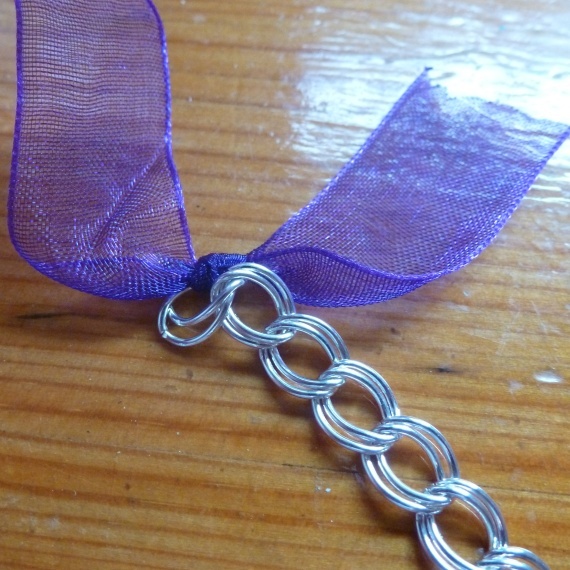 A length of chain (enough to go around your wrist) Make sure the links are big enough to pass the ribbon through. A length of ribbon. I used a piece a good few inches bigger than the chain. A clasp of your choosing. 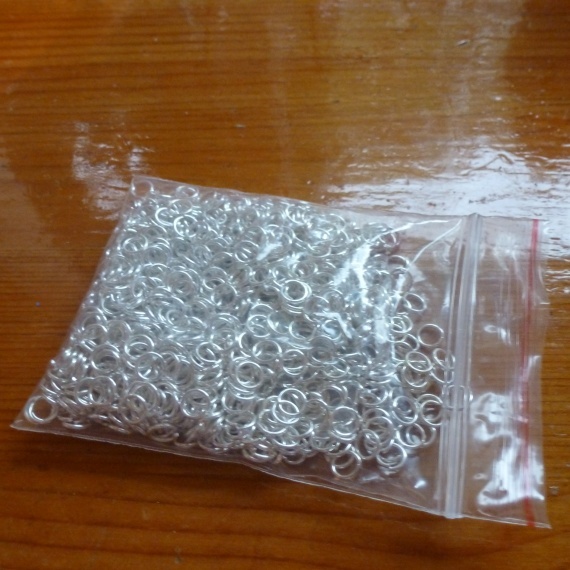 Cut a length of chain long enough that it will fit around your wrist. 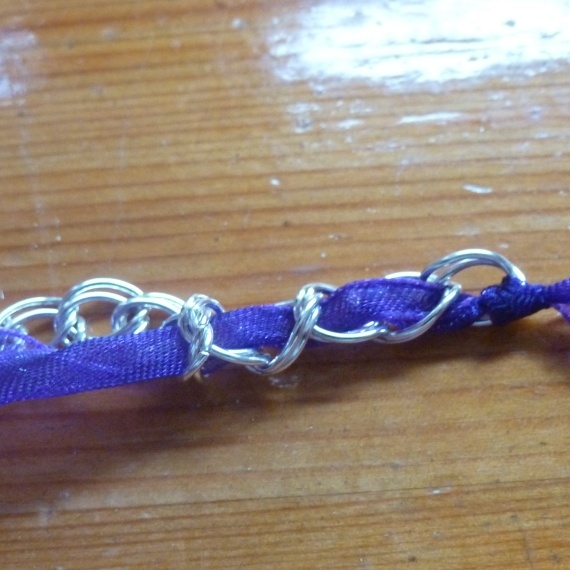 I found when making the bracelets that the chain seemed to bunch up a little as I threaded the ribbon through so you may want to add a cm or so extra but don't forget that you will be adding a clasp. 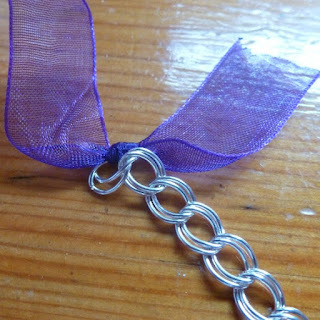 It may be better to add the ribbon until you get to your desired length then cut the chain. Do whatever you find easiest. I used memory wire cutters to cut the chain. Tie the ribbon to one end of the chain. 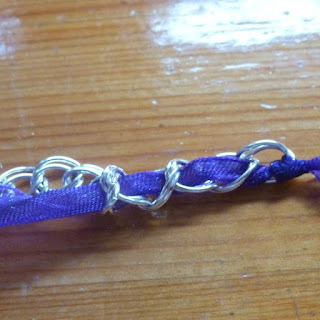 You can add a dot of glue to the knot when you have finished the bracelet to make it extra secure. I didn't have any glue so used clear nail varnish which seemed to work just as well. Start to weave the ribbon through the links of the chain. You may find it easier to thread the ribbon onto a needle ( a darning needle would be ideal) just make sure the eye can pass through the links. I spent ages looking all over the house for my big needle only to realise that it wouldn't fit. Frustrating! After all that threading, have a rest and a cup of tea. When you have finished your brew, tie the ribbon to the end of the chain. 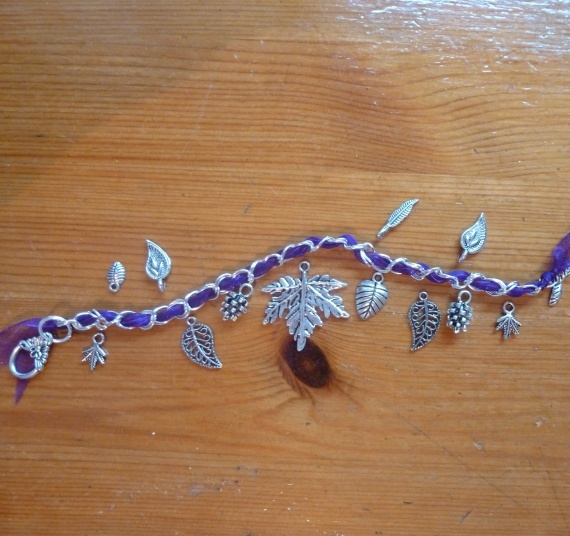 Add your clasp, I had a nature theme in mind so chose a clasp with a flower and leaf design. Set your charms out where you think they would look good. I think this is much easier than adding them as you go and then realising you don't like the look, but use your own preferred way of working. Try not to drop your bag of jump rings.There are a good few hundred in there and I am still picking them out of the carpet. Rarrrrr! Add the charms to the bracelet using the jump rings and there is is- the finished bracelet. There are loads of different colours you could use and different charms too. Thanks for taking the time to do a tutorial. You could use a ribbon that matches the outfit you're wearing. Wish you hadn't mentioned the accident with the jump rings - you've reminded me that I knocked the pin box over this morning when rushing to grab the last things for the craft fair!! I really enjoyed reading this. I like all the extra little bits like the cup of tea! I really like the bracelet at the end too. Thank you. It's lovely! The ribbon makes a lovely touch. What a neat tutorial! Thanks for posting it. Thanks for the tutorial, its lovely! The contrast of the ribbon against the metal is very nice. 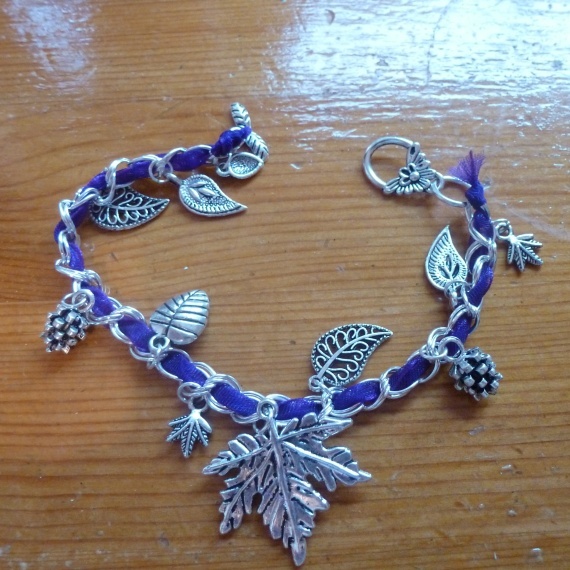 I really like the charms you've used for this bracelet, very autumnal. 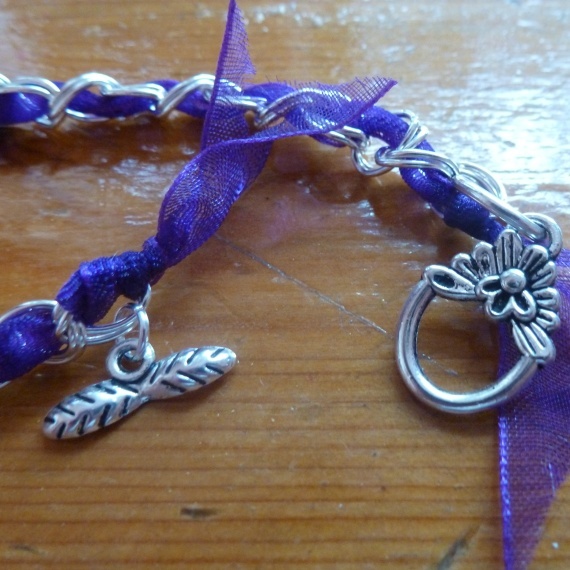 And the purple ribbon is lovely. Great tutorial. 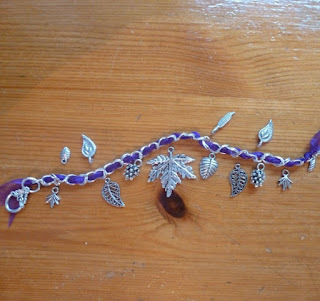 A great way to match jewellery to an outfit, a great tutorial, I use clear nail varnish too. I enjoyed reading your post on the making of your nature bracelet. It's so pretty!